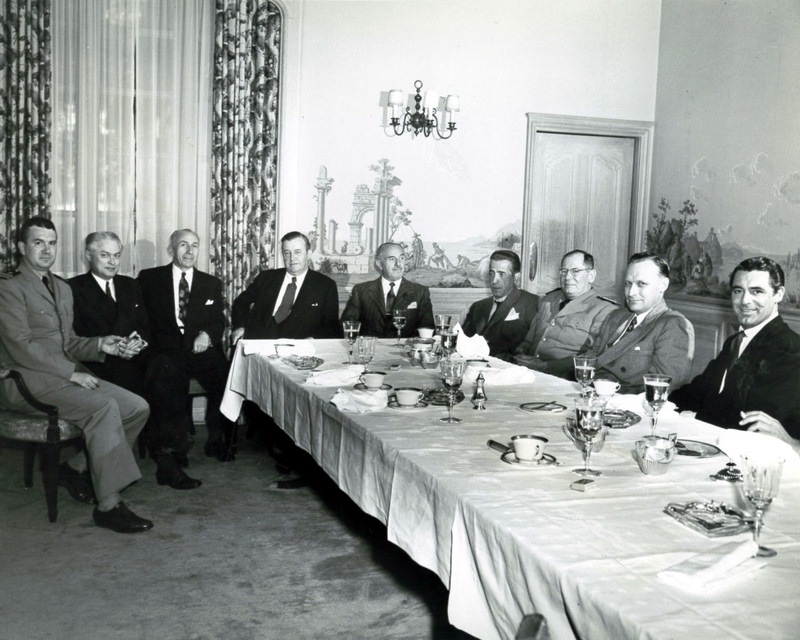 To photos that speak volumes, add this one: It's a Warners luncheon with Harry and Jack hosting military high-ups, these representing the Maritime commission. Also on hand are civilian reps from the British Shipbuilding Conference. Table ornamentation is rounded out by contract star Humphrey Bogart and freelancing Cary Grant, the latter at WB to do Destination Tokyo. The difference between Bogart and Grant on this occasion may well be that Grant is willingly present, while Bogart looks coerced. Their expressions suggest as much, at least to me. I'd call Bogie's sullen, at the least distracted. His tie is loosened amidst orderly knots maintained by the rest. That handkerchief looks ready to jump a fence. Most importantly: Jack L. is not amused. The look he's giving Bogart captures all of what I've read about their relationship. Somewhere between mild and utter disdain. 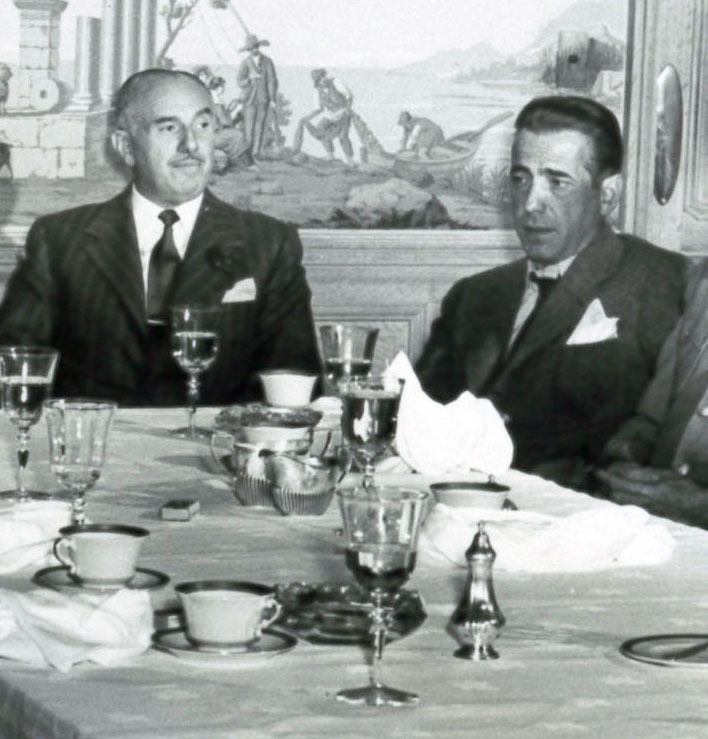 Read Sperber/Lax or Robert Sklar to learn how JL treated HB like kitchen help even after triumphs of The Maltese Falcon and Casablanca. If another guest spilled something, would Jack have made Bogie clean it up? I don't know how much spread this image got in 1943. Given the job of publicity director, I might have stamped "Too Revealing" on the back and circular-filed the negative. Hard to peg Bogie's expression exactly: Indigestion? Fatalism? Ennui? If I were trying to read minds I'd guess, "Has it really come to this?" Cary Grant, on the other hand, would seem to be determined to be Cary Grant at all times, regardless of the circumstances. Maybe Bogie had come directly from the set. Otherwise, he apparently thought enough of the gathering to wear his hair piece. I laughed at your piece about Warner and Bogart. Bogart does look like he'd be happier at any bar. Plus, there he sits with his glued-on hair. I often wonder if guys who wear toupees feel ridiculous in them. They don't look ridiculous (when they're as good as the ones they stuck on Bogie)...but still, I wonder. The thing we always sense in Bogart's acting seems to be at play here, too---the sense that he wasn't interested what others thought, but only what he thought. I think it was an illusion, of course! Many testify to his competitiveness and his unpredictable propensity to pout or fret, in real life. Like most actors, he cared very much what others thought of him. (However, just as many have said they liked him and that he was a total pro, notably the Brits who went down the river with him in Africa for "African Queen".) You can see Bogart among those gathered for the post-screening party of "A Star is Born" at the Cocoanut Grove (I think it was), in a 'special feature' included with the movie on Blu-ray (and in the original 2-disc DVD set.) As I recall, Bogart makes at least one genial wisecrack at Warner's expense as J. L. goes on...and on...talking. It's clear from this and other such film I've seen that Warner thought he was quite a card, and though he isn't as funny as he thinks he is, he does project a kind of enjoyable and relaxed vibe. He wasn't a stiff.